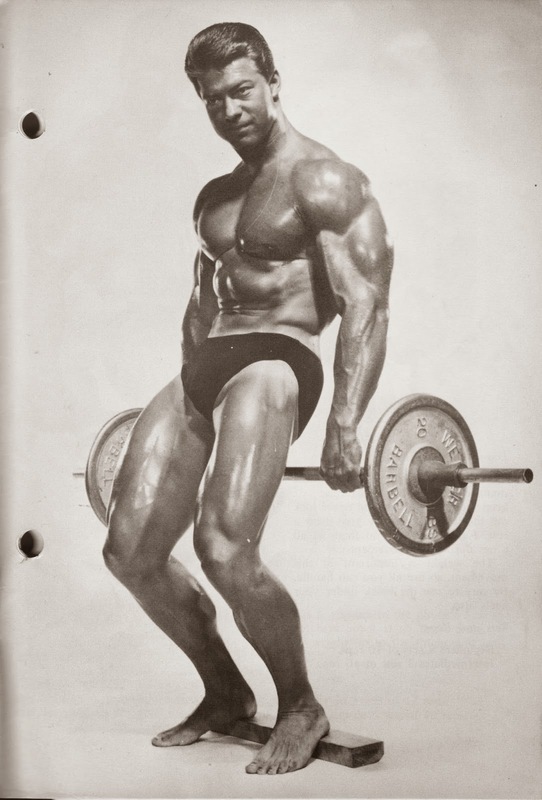 The peak contraction principle has been used by many bodybuilders for quite a long time. I believe I saw mention of it as far back as twelve years ago in a very popular weight training magazine. This article showed how it was possible, using the peak contraction principle, to add greatly to the definition and muscle shape of the muscles involved. Usually articles appeared showing how it was possible to cut up that massive bulk by using the peak contraction principle and a high protein diet. By peak contraction it is meant that continuous tension is put upon the muscle being exercised, with the utmost muscular exertion being placed in such a position that the contraction is greatly intensified, to such a degree that the muscle under strain actually peaks, or balls up to a certain extent. This cramping of the muscle at a particular point in the performance of an exercise is what we term peak contraction. And brother, does it work! Any bodybuilder who is interested in shaping up his massive but smooth physique for an upcoming contest would really benefit from a few months of peak contraction work. Such training would literally cut his muscles to ribbons, as the saying goes. It would also greatly add to his muscle size. At least as far as appearances go, that is. Of course, in the case of the contestant who is training down for a future event, the addition of muscle size, at this point, is second in importance to the acquiring of a shapely, well muscled, defined physique. 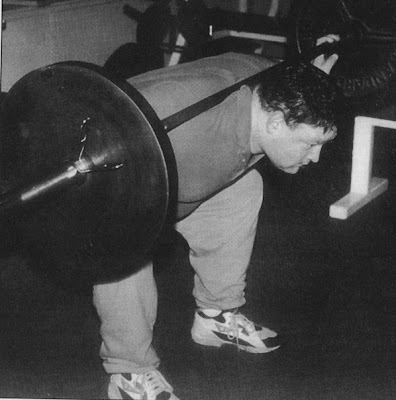 The reason that peak contraction work does not usually add greatly to increasing muscle size is that the trainee usually uses light weights, high repetitions, coupled with high set, to literally burn off the outer layer of fat which, in itself, is detrimental in the acquisition of a well defined physique. So it seems that the peak contraction principle, however effective it may be, can only be used by bodybuilders who need greater muscularity, and who already have developed a basic foundation from which to cut up. This means that the average trainee who is basically underweight cannot utilize this system and expect any real substantial gains. Up until now, anyone who believed the statements which I have just related to you in the above paragraph, quite naturally would have believed them to be true and would have avoided the peak contraction principle until after he had added greatly to his body mass and power. But today he would be very, very far from the truth. I am happy to report that some experiments I have conducted with myself a few of the other fellows whom I train, indicate conclusively that the peak contraction method of training can, under the proper circumstances, greatly add to the muscle mass and the power of the trainee. Of course, we are not talking about the rank beginner in this situation. The men who conducted this experiment with me were all full fledged weight men of at least three years training experience. All were in good basic health. All were eating the types of diets as outlined in back issues of this magazine. These are the weight gaining diets. They are very result producing in themselves. Couple them with the proper training principles and they become fabulous. The men trained three times per week. They performed full body routines; no super-setting or tri-setting was allowed. This was to be an honest experiment; we wanted to see how much solid, useful muscle tissue could be gained. We were not interested in seeing how large we could pump our muscles with inflated tissue. Only basic movements would be allowed. Each workout lasted about 1.5 hours. Rest periods between sets were kept at a maximum of two minutes. Our three 'guinea pigs' performed one movement per bodypart and performed 5 sets of between 3-5 repetitions. This was the main part of my research along this line. I wanted to see just what one could expect if heavy weights were used in the peak contraction movements instead of the usual light ones. I thought that perhaps this was the reason why men who had previously used this system could not gain additional muscle size with the principle involved. I believe my experiment proves me right. At the beginning of this experiment it was hard to find fellows who were willing to take the chance on experimenting on a principle which had never been used before in the way it was to be used now. However, after much prodding and pleading I did manage to find these three. And after a few days preliminary instruction we were on our way -- finally ready to begin! The men were told to fortify their usually good diets with additional protein by means of a small box of Knox gelatin before retiring at night. This meant an extra 50 grams of protein for muscle building. They also increased their intake of vitamins and minerals. This made them fertile soil for this system to begin its work upon them. Each workout would begin with the hack squat. After an initial set of 10 fairly easy repetitions, the weight was increased to an amount that would allow only 4 reps. These repetitions were performed slowly, with concentration on cramping the legs on the finished portion of the movement. When 5 sets of 5 could be performed, the weight was increased. This movement works the entire leg area quite well. The next movement was for the chest. For this we selected the decline dumbbell press. Once again the initial set of 10 repetitions was performed followed by 5 sets of 4 reps. 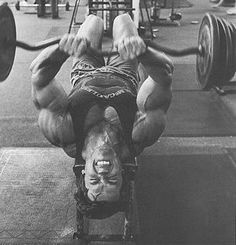 The weights were increased gradually, again cramping at the finish position of each rep.
For the shoulders we chose the lateral raise on the incline. This is performed by using one arm at a time. You lie on your side on the incline; from here you perform a one arm lateral raise. The same type of personal performance was used, the cramping, and the same rep scheme. For the upper back we chose the pulldown behind neck on the lat machine. We concentrated on cramping the upper back at the end of the movement when the arms are lowered. The same repetition scheme was used. This one is very effective. Next, for the lower back we chose the bend over exercise with a barbell. We warmed up with 10 easy repetitions and then increased the weight to all we could handle for 3 reps. When 5 sets of 3 reps could be performed the weight was increased. We were sure to perform this one quite slowly, as it is easy to strain oneself if not careful. For the triceps we chose the lying triceps extension on bench. We made sure to follow the same set/rep scheme as on the hack squats, and performed the reps very slowly in order to cramp the triceps to the fullest. These work the triceps hard! 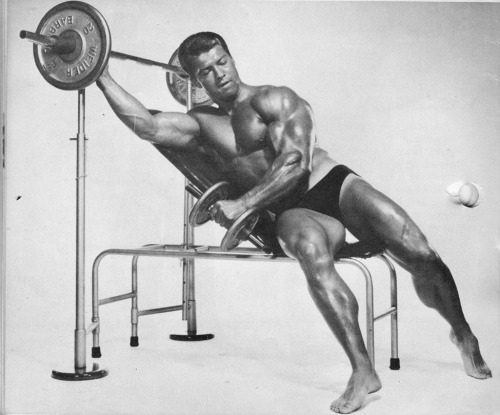 Finally, for the biceps we performed the Larry Scott preacher bench curl as shown in the photo up top. This one is really a killer, so be sure to work up the poundage slowly before you go all the way out, using the same rep scheme as on the hack squats. At the end of this routine the trainees were more than surprised as their bodyweight increased and their muscles grew larger because they were worked most completely in an interesting yet severe manner. And most important of all, when they returned to the normal performance of their regular movements they found out that they were much stronger. For example, Tom Dudas worked up to 150 pounds in the preacher bench curl. When returning to his regular standing barbell curl he handled 180 quite easily. I used the decline flye movement using this principle and worked up to 90 pound dumbbells. When I returned to the regular flat bench flying motion I found that I could handle 105's in regular style. Because the peak contraction principle makes the muscles work very hard, when you return to the regular style on the regular movements you will find that you power has increased greatly. And I don't think that will be too hard for you guys to take. do you?